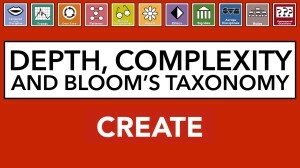 In this series, we'll be climbing Bloom's Taxonomy to help all students reach the highest levels. 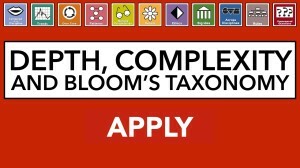 Let's explore practical ways to take students to the Apply level of Bloom's Taxonomy while integrating depth and complexity at a high level. 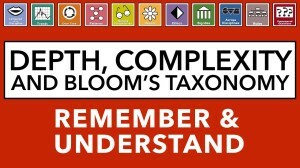 To differentiate for gifted students, we can carefully climb Bloom's taxonomy and combine those thinking skills with the prompts of depth and complexity. Let's look at the Analyze thinking skill. 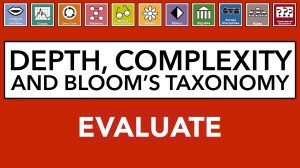 Build on the "analyze" level of Bloom's to take students up the "evaluate," where they'll form a strong opinion backed up with evidence collected earlier in their climb. After climbing all the way up Bloom's Taxonomy, students will now realistically change existing ideas to create something new.